Dr. Jacob has been a dentist since 1994. She graduated from India with a Bachelor of Dental Surgery degree, and moved to Canada in 1999. She joined the Advanced Placement program and graduated from the University of Alberta. Dr. Jacob has been an associate dentist at a few dental clinics in Edmonton, and is a part time clinical instructor at Faculty of Dentistry, University of Alberta. She has extensive experience in all aspects of dentistry and prides herself on her strong dedication to patient care. Her unparalleled commitment to excellence, quality, and detail in her work, and focus on patient comfort is commendable. Dr. Jacob finds educating patients and improving their oral health and smile to be extremely rewarding. She goes the extra mile to make a positive difference in the well-being of her patients. Dr. Jacob is dedicated to life-long learning through continuing dental education, and holds memberships in the Canadian Dental Association and International Association for Orthodontics, Alberta Dental Association and College, Edmonton District and Dental Society, and Academy of Gp Orthodontics. Dr. Jacob lives in Edmonton with her husband and two children, enjoys outdoor activities, and spending quality time with the family. She enjoys her time volunteering at schools, churches, inner city, and mission trips. Linda has been working in the dental office for 7 years along with 28 years of experience in the dental and health insurance field. Her passion is working in a prestigious dental practice and with great people! She considers them her family. She is knowledgeable about your dental needs and is dedicated to making your dental experience as smooth as possible.She enjoys meeting and welcoming new patients. When not in the dental office, she enjoys spending time with her loving spouse, family, 5 grandchildren, cooking, gardening and vacationing in Mexico. She has been in the dental field for 25 years after graduating in 1991 from the NAIT Dental Assisting Program. She started off chairside assisting and then over time moved her way to the front dealing the administration part of dentistry. She enjoys interaction with patients and getting to know them on more of a personal basis, as well as helping these patients better understand the dental treatment they require and why.She is there to answer any dental questions you may have , whether it be procedures, insurance, financial, etc. Outside of the office she enjoys the simple things in life: Good Company (her family and pets) Good Health Good Food Good Laughs!! Laura has over 15 years of experience in the dental industry. She is extremely knowledgeable with insurance companies and maximizing your benefits plan to best fit your dental health needs.She exceptional at translating “frozen mouth talk” and ensures you are more than satisfied with your dental visit. In Laura’s spare time she loves being with her family, her fur baby Kujo,cooking, being active by going to the gym, and road trips. Nishia moved from a small town to Edmonton in November 2014. She has been a valuable member of our team since graduating from the Dental Assisting program at KDM in 2015. She ensures all of her patients are comfortable and relaxed during their dental treatments. She is very approachable, kind and well spoken and is able to address any concerns that you may have. She loves having an active lifestyle by camping, playing tennis, and working out. She is also a big oilers fan and likes to attend the games whenever she can. 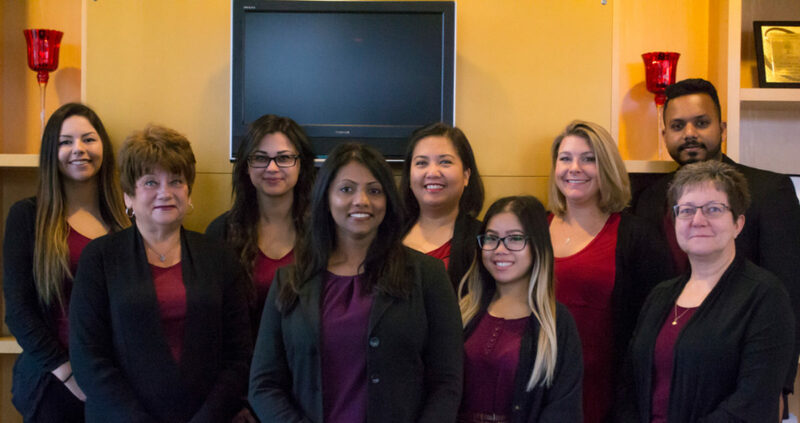 Vilinh joined Signature Smilez Family Dental in 2017 soon after she graduated with high honors from The Toronto College of Dental Hygiene and Auxiliaries. She decided to return to Edmonton to call home. Her priority is ensuring that patients are comfortable during their visit and also enjoys educating patients about practicing oral health. When not at the office, she enjoys spending quality time with family and friends. Flattin moved to Edmonton from Ontario a year ago where he got his Masters in Business Management degree. He graduated from India with a Bachelor in Computer Application Degree.In his free time, he enjoys working out, traveling, seeking adventures in the outdoors and spending time with friends. Kendall joined Signature Smilez Family Dental in 2017. Originally from Ottawa, she received her Advanced Diploma in Dental Hygiene from Algonquin College. Shortly after, she decided to move west calling Edmonton her new home. Her priorities are patient comfort with a focus on educating patients about their oral health and ways to maintain excellent oral health between visits. When not at the office, she enjoys spending time with family/friends, walking with her dog, snowboarding, and travelling when she can.